Dream Pod 9: Feedback Friday: New HGB Polls & JW Painting Contest Ideas! Last week we had 32 members voting on the polls with 78% wanting to keep the 90 degree turns in movement, but 72% feeling that Walker movement should be free to move forward or backward, its full movement without having to turn around move and then turn around again as it is right now. The poll on sensors and measuring was a 50/50 split, so we'll have to come back to that later. The Formation poll was 53% not wanting any change and the rest wanting one of the two change options, we'll have to comeback to this in the future as well. 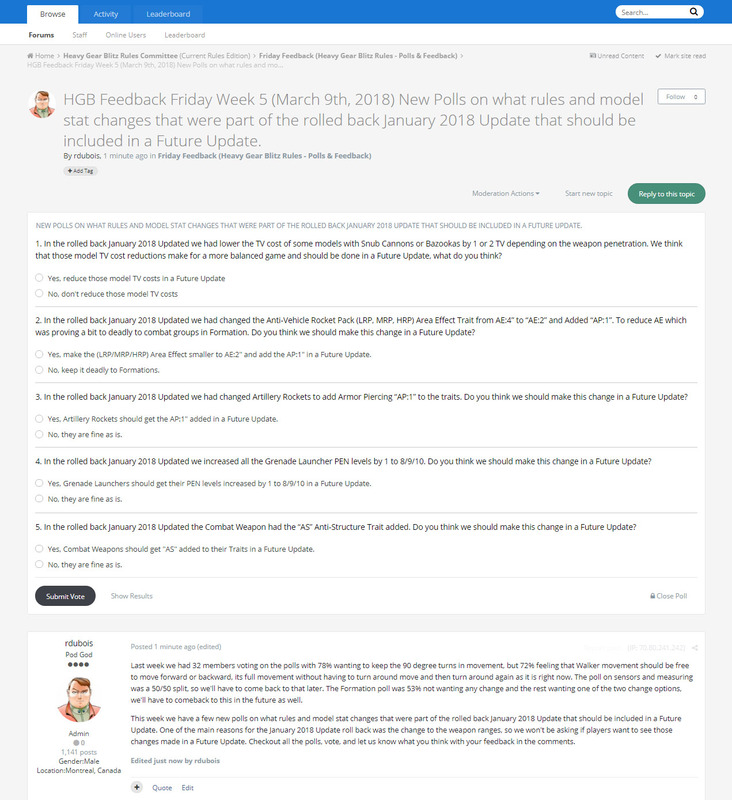 This week we have a few new polls on what rules and model stat changes that were part of the rolled back January 2018 Update that should be included in a Future Update. One of the main reasons for the January 2018 Update roll back was the change to the weapon ranges, so we won't be asking if players want to see those changes made in a Future Update. Click the link below and checkout all the polls, vote, and let us know what you think with your feedback in the comments. For this weeks Jovian Wars Feedback Friday we want your ideas and feedback on DP9 doing a Jovian Wars Miniature Painting Contest. First off we need a cool name for the contest, Heavy Gear has Golden Gear, we need your ideas for what to call the Jovian Wars miniature painting contest. What categories do you think we should have? We were thinking two categories (Best Spaceship and Best Exo-Armor/Fighter Squad) and we get some nice trophies made for them, let us know what you think. Also, when do you think it would be best to launch the contest, and how much time should we give to get entries in? Launch it in July during summer vacation time and give 2 or 3 months to get entries in, for a September or October judging. Click the link below to our DP9 Forum Feedback Friday Jovian Wars thread and let us know what you think, with ideas and feedback in the comments. Home › Blogs › Robert Dubois's blog › Feedback Friday: New HGB Polls & JW Painting Contest Ideas!